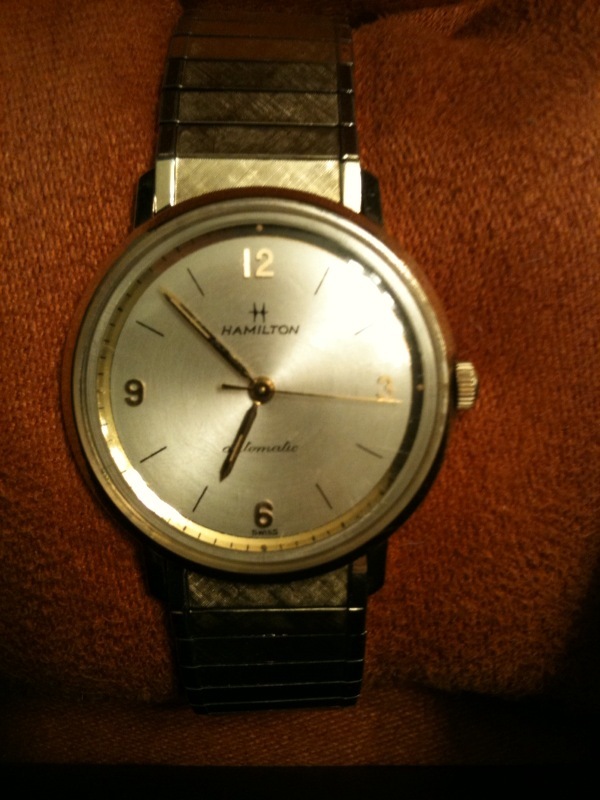 Added a 1964 Hamilton M 100-3 10K RGP(Rolled Gold Plate) D&A Grade 689 to the collection…At a very good price too. Excellent condition and with the original band as well. It is an automatic with a Swiss ETA 689A movement. Hamilton, as you know, was at one time the premier watchmaker in America. They ceased US production in 1969. There are still Hamilton’s being sold, but these are not the original Hamilton. The Swiss company Swatch bought the Hamilton name and produces these watches today. In 1964, this watch sold for $100.00 which is approximately $750.00 today. The M series of watches were only produced in 1964, why, I have no idea. It is a mechanical watch (you wind it daily, you do not insert a battery) and an automatic which means that the movement of your wrist also keeps the watch wound. A beautiful, elegant watch. Simple and sophisticated. Young men would not like it as it is not the size of an hubcap…(that is, huge and vulgar, for those to young to know what an hubcap is). I’m very pleased. I have been looking for the right Hamilton for some time. Oh, and I paid $42.00 for it…I think I’m kind of a BAMF…I’ll have to ask a friend of mine…. Well Mr. Teeritz, you are the man of a thousand vintage watches…Any Hamilton’s in your obviously, very large, watch box? And, what do you think of the vintage Hamilton, if at all? This entry was posted in Accoutrements, Sartorial and tagged Hamilton, Watches by Sir Edward Percival Fox-Ingleby, Bt. Bookmark the permalink.